My 7-year-old son is learning about persuasive writing at school this term. English is his favourite subject AND he can wrap his Mum and me around his little finger – so the art of persuasion is definitely in his skill set! “Making boring plans for your holidays? Give up on them and visit Rainbow Rainforests!” Give up?! - Brilliant! “This is a once in a lifetime, so don’t just stand there, book it!” Wow, that’s quite an aggressive pitch! Over the last couple of nights, he’s taken things to the next level; replacing his usual bedtime reading routine with commercial writing sessions (!!) – tackling ads he’s seen on the TV that he thinks he can improve. 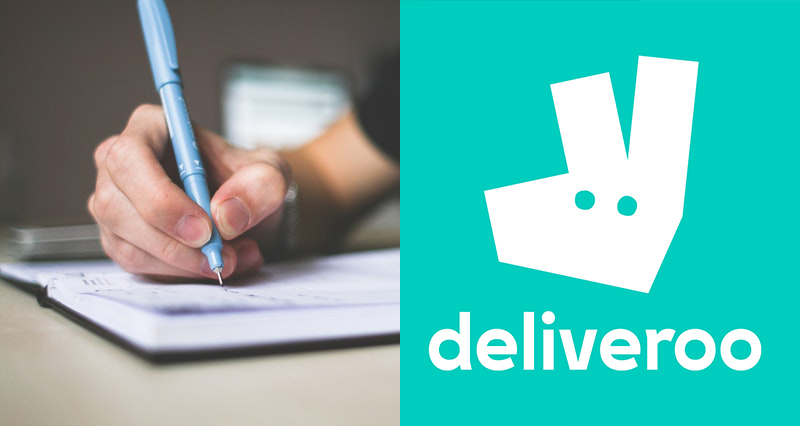 Last night the spotlight was shone on Deliveroo – and I’m loving the results! He opens the fridge door. Inside it’s almost entirely empty apart from a tiny kangaroo (ala the Deliveroo logo) standing on one of the shelves. *Think Zizzis got a specific name check because we were there for lunch last weekend! I have to say (and I know, I know - I would say this because I’m his Dad!) I’m really impressed with his work here! Simply and effectively communicating the message AND incorporating a super catchy hook. Nice!